RTI (www.rti.org) is an independent, non-profit organization dedicated o conducting innovative, multidisciplinary research that improves the human condition. With a worldwide staff of more than 4,000 people, RTI offers innovative research and development and multidisciplinary services. 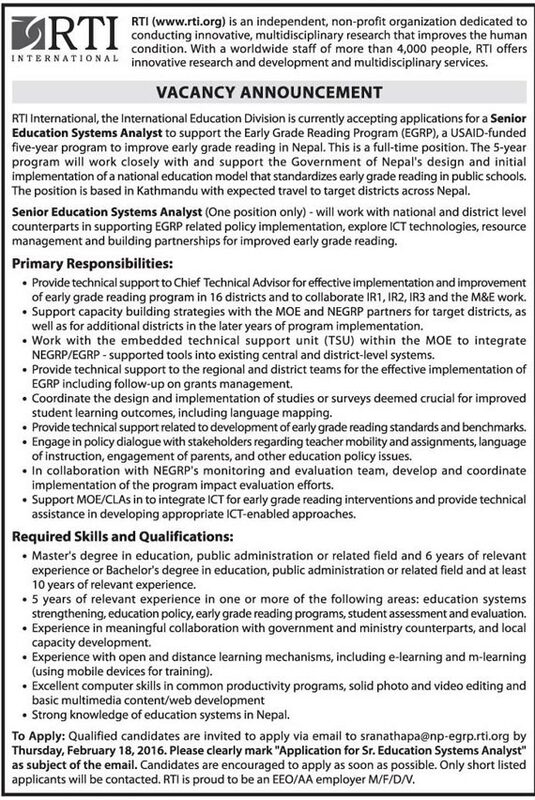 RTI International, the International Education Division is currently accepting applications for a Senior Education Systems Analyst to support the Early Grade Reading Program (EGRP), a USAID-funded five-year program to improve early grade reading Nepal. This is a full time position. The 5 year program will work closely with and support the Government of Nepal’s design and initial implementation of a national education model that standardizes early grade reading in public schools. The position is based in Kathmandu with expected travel to target districts across Nepal. Senior Education Systems Analyst (one position only) – will work with national and district level counterparts in supporting EGRP related policy implementation , explore ICT technologies, resource management and building partnerships for improved early grade reading.